Finally the first blog from our fantastic journey to Malaysia and Borneo! I have been a bit too busy writing the book that I hope you look forward to reading. Me and my two daughters had a draft plan, but only 10 days on Borneo, and there are so many things to do there. 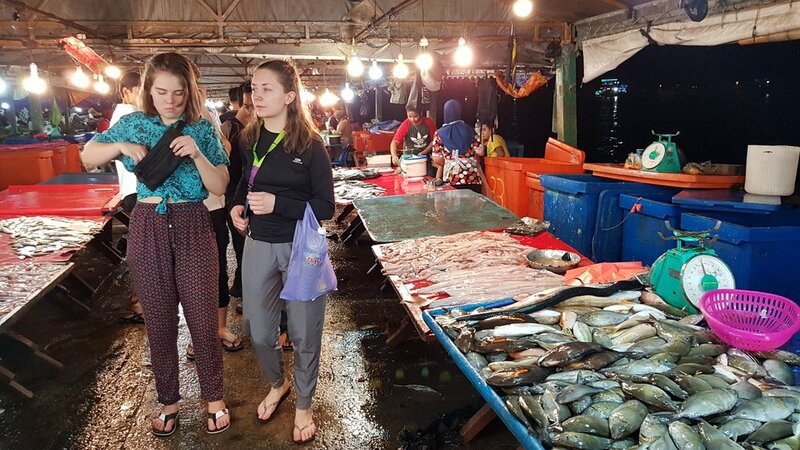 In Kota Kinabalu, after 29 hours journey, we started with a walk through the markets to feel the warmth, the smell of fish and grill, and to listen to the sounds. What a start of our journey! Ray Rahman National park consists of five islands, is fantastic, and close to the city. We had a day with snorkeling, long jungle walks, and a bit too exciting boat rides between Manukan and Sapi. In the evening we enjoyed delicious local food which was one of my strong memories from my last visit to Kota Kinabalu. Our flight to Sandakan, on the other side of Borneo, took off at 7. What days we had at Sepilok and Kinabatangan River! We met many orangutans, sun bears, proboscis on our jungle walks in daylight and the darkest night, and also on our boat tours on the river. We stayed in a fantastic house at Natural Resort, with several naughty macaques eager to steal your food. On the third day, we passed by the Gomantong caves and met wild orangutans! Wow, what a bonus!! Our luck continued. We got a lift direct to Semporna and could go directly to paradise. Mabul is not Sipadan but in the same amazing waters! We had three fantastic snorkeling tours, several walks in the genuine villages on the island, and plenty of time to enjoy the delicious food and great company on our pier, looking down on the crystal clear water, the turtles, and the starfish. On top of that, we celebrated one of our best New Year’s Eves with the locals. Go there, and stay at Mabul Backpackers. They serve great food, have a great location, and are so friendly. We were not eager to leave Mabul but had more plans! Macedonia instead of Albania and Montenegro! Croatia here we come! Blog 2 from "Travel light in Bosnia, Croatia & Venice"
This time last year I was in Angkor Wat!